There was a time not so long ago that my son was addicted to Barney. He would watch only Barney DVDs the whole day. That’s the reason why I have also memorized most of the Barney songs. That’s what also prompted his Dad to buy him a big Barney stuffed toy. At that time–I think he was 2 years old then–that Barney was bigger than him. 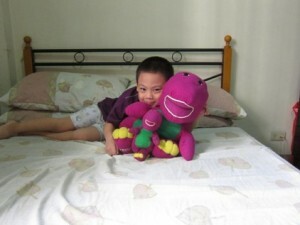 He already owned a small Barney stuffed toy prior to his Dad buying him the bigger Barney. The smaller Barney was a gift from one of his godparents. He’s not playing with those stuffed toys anymore, and I already stored them somewhere safe because, according to his pediatrician, stuffed toys collect dust easily, which might be one of the reasons why he suffered from frequent allergic colds and cough before. Since Barney is the only purple toy my son has, I had to take them out again for this week’s Mommy Moments’ theme. Not to be outdone, my son wore a purple shirt, too, for picture taking. So now, the purple boy meets the purple toys. LOL! This entry was posted in Mommy Moments, Purple. Bookmark the permalink. awww, cute picture! my son loves barney too! But it’s not my purple. Please don’t forget to follow me @ GFC & NetworkedBlogs. Thanks very much! My daughter fave too. Yes you are right kaya maybe its time for me to buy a cabinet for the stuff toys. Hi Barney and Justin! So cute. Of course,Barney! The most favorite purple dino!!! My son is still 4 months old, kaya hindi pa ako napasubo sa non stop barney on dvd.. hehehe..
Barney starred several times in many MM posts this week. There’s something about kids and their stuffed toys that are bigger than they are. You see an aura of cuteness. my daughter didn’t like barney. I wonder why? barney is cute…. sarap e hug! Oh cute, baby and barney! Have a lovely weekend. i love how your son posed gamely for the camera! happy mommy moments! naku my daughter super addicted to barney especially when she was 2 years old now that she’s 3 parang naiiba na ang gusto. She has that one barney big and the smaller one ..
wow, that’s a cute picture with barney! my kids fave too. 🙂 PinayMum – Mommy’s Life Around…wishing you a great week! My niece loves Barney too. Maybe because of his purple color. Anyway, all you dp is to wash the stuffed toys regularly. You don’t need to store them away if your son still enjoys playing with them.